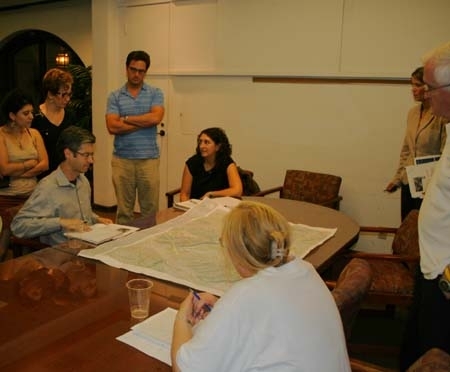 July 25, 2006 - Interested community members, representatives from non-profit organizations, and government officials joined the Arroyo Seco Foundation at the Los Angeles River Center last night to discuss the future of the Arroyo's Confluence with the Los Angeles River. 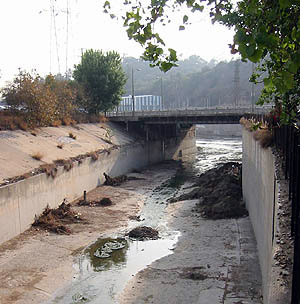 The meeting was called in response to the Confluence not being chosen as an opportunity site in the Los Angeles River's Revitalization Plan. A free flow of information was shared by city officials and stakeholders regarding the Confluence. Tim Brick, managing director of the Arroyo Seco Foundation, spoke about the integral role the Confluence plays from an environmental, cultural, historical and recreational standpoint. He also discussed the planning efforts currently underway in the Arroyo and around the Confluence. One highlight was an overview of progress being made regarding Confluence Park under the guidance of the Mountains Recreation and Conservation Authority (MRCA). MRCA is moving forward with plans for the park, including acquisition of property and design of the park. The US Army Corps of Engineers is also undertaking a feasbility study on the LA River that will consider the Confluence. Jill Sourial, Council Deputy from Council District 1, and Carol Armstrong, from the Los Angeles Bureau of Engineering, discussed how the Confluence fits into the Revitalization Plan. They assured participants that the Confluence will be part of the revitalization plan, although not directly an opportunity site. They emphasized that the Confluence will be looked at as part of the Taylor Yard opportunity site. Both Sourial and Armstrong acknowledged the tremendous community concern, energy and involvement within the communities that are found along the Arroyo regarding our stream and watershed. Ryan Lehman of Livable Places, which is developing an affordable housing site near the Confluence, spoke of the need for open space and parks for people moving into the area, as well as improved access for multi-modal transportation. Other community members, like Carmela Gomes, thought that there should be improved outreach to local schools to raise awareness about not just the Confluence but also the whole Arroyo and Los Angeles River. Joyce Dillard emphasized improved coordination with the Army Corps of Engineers study of the Los Angeles River and outreach to local businesses. Everyone agreed that continued participation in the LA River Revitalization Plan was needed to insure that the Confluence does get the focus it deserves as part of the Taylor Yard opportunity site. It was a lively discussion that demonstrated the depth of people's commitment to the Arroyo Seco. Participants agreed that this site represents a wonderful opportunity to improve the local environment, link transportation modes, provide open-space and raise awareness about our rivers. Stay tuned to Arroyo_Seco_News and www.arroyoseco.org for information regarding the Confluence and the Arroyo.